The entire range of crops referred to as cucurbits are affected by various foliar diseases in the Northeast. Most damage appears on leaves and stems, but in several instances the fruit are directly infected or will develop poorly if foliar infections are severe. 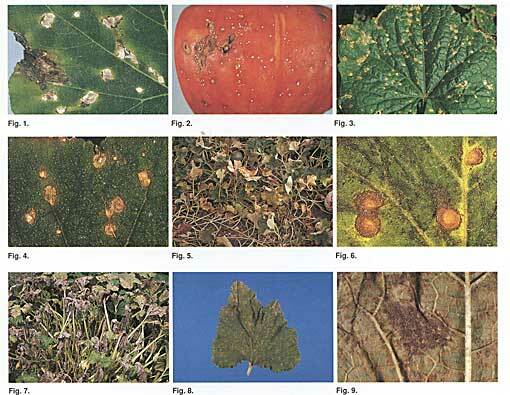 The diseases discussed are angular leaf spot, caused by the bacterium Pseudomonas syringae pv. lachrymans, and three fungal diseases: Ulocladium leaf spot caused by Ulocladium cucurbitae, which only infects cucumber; Alternaria leaf blight caused by Alternaria cucumerina, which potentially can infect all cucurbits but is most important on cantaloupe and muskmelon; and downy mildew caused by Pseudoperonospora cubensis, which can be important for all cucurbits when weather conditions are favorable. This bacterial disease can occur on most cucurbits, including cucumber, muskmelon, pumpkin, and winter squash. The disease is less common on cucumber because resistant varieties are widely grown. Leaf spots are variable in size and may be angular in shape because leaf veins limit enlargement of spots. Initial symptoms appear as brown water-soaked spots, as illustrated on butternut squash (fig. 1). Under moist conditions, especially in early morning, small droplets of bacterial ooze can come from the water-soaked areas; which, when dry, appear as a white residue. The initial brown spots may be surrounded by a yellow halo, become white, and, as they dry, tear away from the healthy tissue, producing irregular holes in the affected leaves. Fruit spots are smaller than leaf spots and are usually circular (fig. 2). These spots, as shown on the processing squash Delicious, are usually superficial but can develop into deeper rots if secondary soft-rot bacteria invade. The bacteria can survive for possibly 2 years in soil or debris from diseased plants. It is also known to be associated with seed. Bacteria can enter through wounds or stomates. Moisture in the form of rainfall or relative humidity greater than 95 percent for several days is required for infection and later disease development. Dry weather for 2 weeks can arrest the disease. Controls include the selection of resistant cucumber varieties, use of disease-free seed, and a 2year rotation out of all cucurbits. Check with your seed supplier for the current list of resistant cucumbers. Copper fungicides can be applied to slow disease spread during particularly wet periods but can be dropped if dry weather continues for 2 weeks. This disease has occurred in New York in localized plots near Ithaca since the early 1980s but was first found in commercial cucumber fields in 1988. It has since been reported from other areas of the country and was previously recorded as a different fungal species in England and parts of Europe. Because only cucumbers are affected and superficially the disease could be confused with angular leaf spot, which previously was a major concern for cucumber growers, the disease may have been present for a longer period than realized. The appearance of symptoms and the environmental conditions required for disease development differ greatly from those of angular leaf spot. Ulocladium leaf spot lesions may appear in early to mid-August as reddish brown spots 1 to 2 mm in diameter on lower leaves near the crown (fig. 3). With adequate moisture and moderate summer temperatures, lesions enlarge (fig. 4). Lesions are mostly circular to irregular in shape, measuring 6 to 7 mm in diameter, but occasionally are larger. The centers are beige to brown but occasionally white, surrounded by a dark brown ring and a brown halo. Lesions may tear as the leaves mature. No fruiting bodies are present. Lesions are typically invaded by a secondary fungus (Alternaria alternata), which acts as a saprophyte. Conidia morphology is temperature-dependent, appearing alternarioid at 46° F, intermediate at 70° F, and ulocladioid at 81° F.
Ulocladium cucurbitae survives between crops on infected debris in the soil, probably as dormant mycelium or as chlamydospores (thick-walled modifications of the mycelium) similar to Alternaria spp. Conidia that act as primary inoculum for infections are produced in the spring under appropriate conditions. A 2-year rotation out of cucumber should be practiced. Currently available cucumber varieties are resistant to angular leaf spot but are susceptible to U. cucurbitae. Varieties resistant to Ulocladium leaf spot will be available soon. Protectant fungicides provide effective control. Alternaria leaf blight caused by the fungus Alternaria cucumerina is a common disease of muskmelon (cantaloupe) but can also infect watermelon, squash, and cucumber. Leaf blight usually occurs from midseason or when the canopy closes, can reduce late season fruit production, and can result in poor quality if the disease is severe (fig. 5). Symptoms first appear on the upper surface of crown leaves as small spots 1 to 2 mm in diameter although other lesions can be more than 10 mm in diameter (nearly one-half inch) (fig. 6). These larger spots can show a targetlike pattern of rings which is typical of most Alternaria spp. Leaf blight overwinters as mycelium or chlamydospores in diseased plant debris and can probably survive for more than a year. Conidia are produced in the spring and act as the primary inoculum. Conidia produced on infected plants provide inoculum for repeating secondary cycles during the season. A 2-year rotation out of cucurbits is the easiest way to break this cycle. There are few Alternaria-resistant varieties. Protectant fungicides should be applied in mid-July when vines run and fruit have been set. Infection and disease development are favored by lengthy periods of high relative humidity (18 hours) over a broad range of temperatures (68 to 90° F). This devastating disease is caused by the fungus Pseudoperonospora cubensis. The disease is most important in the Northeast on muskmelon, pumpkin, and winter squash, though all cucurbits are susceptible. Because the fungus does not overwinter in the North, the disease is reintroduced each season by airborne conidia blown into the area from southern states. If appropriate conditions are present, plantings can be infected so rapidly that they appear to have been frosted (fig. 7). Foliar symptoms vary depending on how quickly infection occurs. Upper surfaces of leaves may show angular pale-green areas bounded by leaf veins that give the impression of mosaic. These areas change to yellow angular spots and become necrotic as the disease progresses. When leaves are infected by a heavy spore shower, small individual necrotic and chlorotic flecks appear on the upper surface (fig. 8). In a moist environment, sporulation occurs on the lower leaf surface. The chlorotic flecks appear as light brown areas when held up to the light. Areas with active sporulation give the undersurface a purplish or dark brown sooty appearance (fig. 9). The fungal growth consists of large lemon-shaped spores called sporangia that are borne on branched structures called conidiophores. The sporangia are wind-borne and can survive over long distances when the air is moist. They are also readily spread to adjoining plants by splashing rain. Although most downy mildew fungi are considered cool, wet weather diseases, cucurbit mildew can infect plants over a wide temperature range (50-80° F) with the optimum at 61-72° F. Periods of heavy dew lasting into midmorning are sufficient for infection to occur. Mid-August is a critical time to scout for mildew because appropriate environmental conditions usually exist then in the Hudson Valley and on Long Island. Because disease development is dependent upon outside inoculum, rotation cannot prevent the disease. Select resistant varieties if they are available. Downy mildew can be controlled with the application of protectant and systemic fungicides.